Why am I walking? 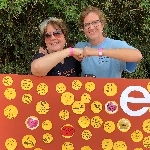 I am participating in Easter Seals’ Walk With Me because I want to spread hope and raise funds to help individuals and families living with all types of disabilities. For 70+ years Easter Seals Greater Houston has helped veterans adjust to civilian life with service dogs and mental health services, taught infants with developmental delays how to walk and talk, given children with cerebral palsy a sense of community through camps and play groups, mentored teens with autism so they can feel prepared and empowered to enter the workforce, and so much more! Easter Seals is an essential partner in providing help, hope and answers to our loved ones with disabilities. Please join me on this journey so Easter Seals can continue providing life-changing services to the 11,000+ veterans, children and adults served each year in the Greater Houston community. How can YOU help? Register to walk or make a donation in support of my fundraising efforts. Why do I need your support? According to the U.S. census bureau, 1 in 5 Americans is living with a disability. These are our family members, neighbors, coworkers, and friends. Join me as I walk alongside Easter Seals clients, therapists, donors and thousands of others at Walk With Me. What a huge difference you will make in the life of a person with a disability – an investment with overwhelming returns! Easter Seals Greater Houston is a fiscally responsible organization, and one of the most efficient charities in Texas, with $0.92 of every dollar going to direct client services in Houston.